An etsy shop customer custom ordered these hand cut papel picados from me (it took a long time, but it was fun and worth it!) and strung them up above her headboard. I was speechless when I saw this! I want to make more! Get your custom orders to me if you want your own custom papel picados! Due to a happy misunderstanding, I have started creating custom papel picados. I thought I was being commissioned to create my papel picado designs, done digitally and then printed out. But my customer wanted actual cut out, custom picados. I saw it as a challenge and an opportunity to create what I’d always wanted to try, but never actually had the time to do. Yes, it’s hard work, but I enjoy it much more than I thought I would. I’m pretty quick at it as well! Recovery for my hand is the longest part of the process. Here are the first two of a 5 piece series. I’ll be working on 3 tomorrow and hopefully get 4 and 5 done this weekend. Stay tuned! And let me know what you think of these so far! 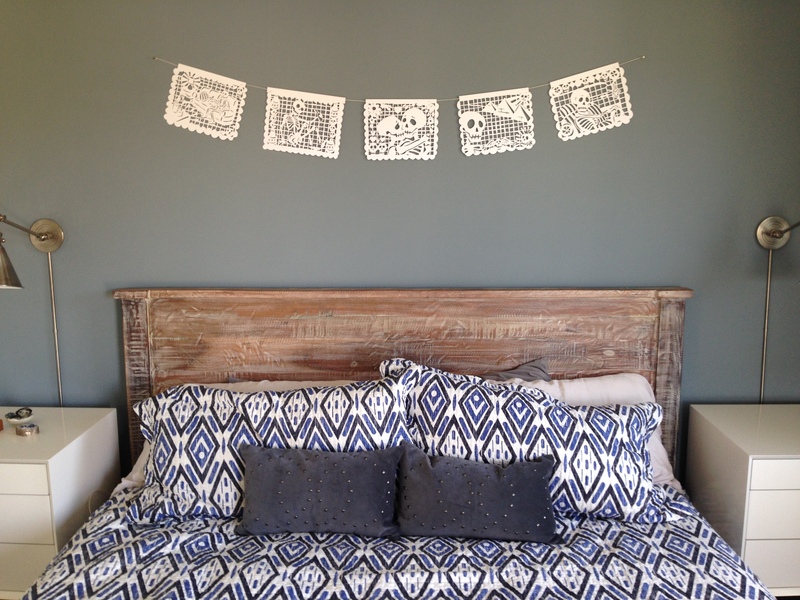 Want a custom papel picado of your own? Contact me! First annual $5 SALE happening now! Go to the HEAVENLY SKULL shop! I will be posting more Treasuries and Gift Guides! Stay Tuned! Here’s my beautiful neighbor Diana wearing one of our Creamsicle Calavera Flowers! I only have one left so make sure to contact me if you want it! $8.00 + S/H. This is a commissioned portrait from my customer Cherie. Based off of the reference photo she provided as well as her love for the combination of pink and brown, I was inspired by the feathers (and by watching Boardwalk Empire over and over again) and lights for this delicate and ethereal feel. Portraits are available for $40 at the shop, one person. If you need more than one person in the portrait, let me know! Stay tuned for more heavenly, cute, and sometimes creepy things at Heavenly Skull!